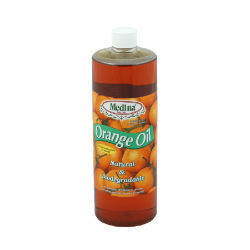 Medina Orange Oil is 98% cold pressed orange peel and 2% emulsifier. It contains the raw oil collected from the citrus peel during juice extraction. No heat is applied during this "cold processed" process thereby preserving the integrity of the oil. Orange oil can be used in a variety of household and gardening applications. Options: 16 oz. 32 oz. FOLIAR APPLICATION: Mix 2 ounces per gallon of water. Apply during the cooler part of the day to prevent burning of plant foliage.